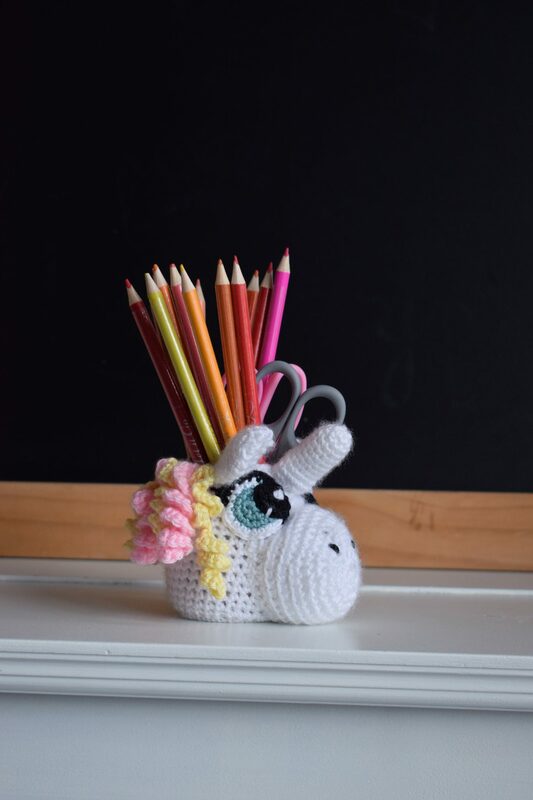 Unicorn jar- cover looks like a unicorn- Free crochet pattern! 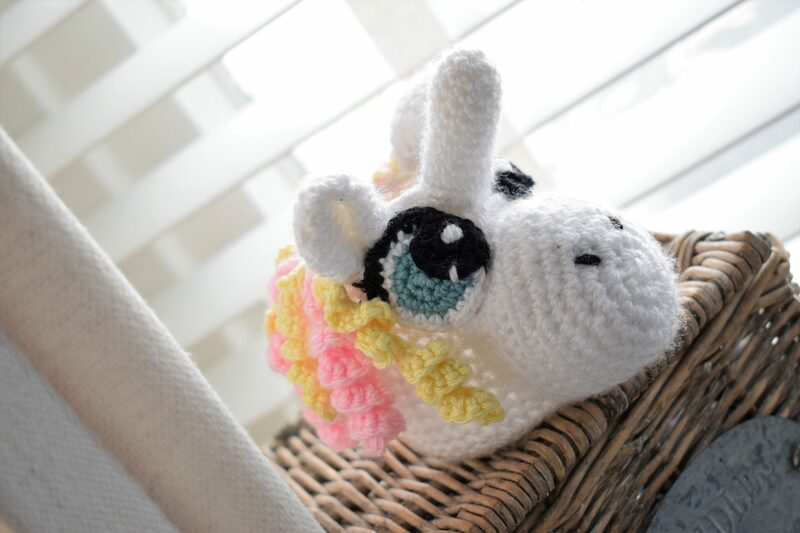 Unicorns are extremely popular with my children, and sometimes I like to crochet something small. Today I combined those two , just because it makes my two children so happy! Like I said, they are completely crazy about unicorns for a very long time now. It started with ‘my little pony’ (many of them!) and those are still very popular with my girls. And besides that, unicorns are very hip! They are quite popular these days and you see them printed on t-shirts, swimsuits, you name it. Well, I had an empty olvarit jar, (you know, the little baby snack from 4 months on) . I wanted to do something with it and then I came up with this idea. Actually I didn’t exactly know what I wanted to make, but the result has come out quite nicely. You could put in a small plant or a few small pencils.. Very sweet!! Yarn leftovers for the different parts. I used to hook up the jar and the nose ‘Stylecraft Special DK’ in the color white. Crochet with crochet hook 5mm and stylecraft special DK white. Make a magic ring. Crochet continuously in a spiral, marking the beginning of each round with a stitch marker. Rnd 1. 7 single crochet in the magic ring. Maybe you should hook a little less until you are at the edge, or a bit further. Just adjust the crochet around the pot and see if you have reached the first narrowing of the pot. When you arrived the first taper, you will hook the next row. Rnd 1. 8 single crochet in the magic ring. Fill the nose with fiber filling and attach it to the crocheted around the pot. In round 6 you first crocheted 17 single crochet and then reduced a number of stitches. The side of the work (where the decrease’s are made), that is the side that comes to the top of your work: the top of the nose. 2 rounds of the top of the nose, you sew flat on the crocheted piece. The rest of the 17 stitches are exactly fixed to the edge. This gives the nose the shape it needs. Crochet with crochet hook 3.5mm and stylecraft special DK white. Rnd 1. 5 single crochet in the magic ring. The ears fold automatically double, this because you have crocheted around. When you have two of them, you pin them at the edge of the pot. Only when the rest of the parts are crocheted and also neatly pinned to the potty and they are in the right place, only then you go to fix all other parts. Maak een magische ring. Haak het patroon in het rond. Crochet with the color yarn you wish and needle 5mm a chain of 16. In the second chain of the needle you hook 3 single crochet. Do this in every next stitch until the end. Attach the curl firmly to the edge, directly next to the ear. 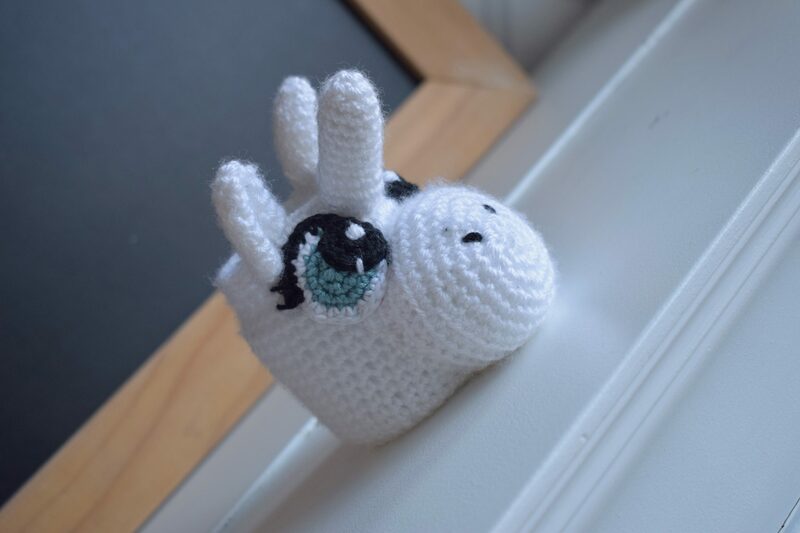 So, your sweet unicorn jar is ready! And now see what you are going to do with it! I’m curious! Do you let me know? Schattig! Dochter en ik zijn niet gewonnen voor de unicornrage, maar ik vind het wel knap dat je zomaar zelf een patroon maakt voor zo’n potje! haha, ik ken er meer die er niet zo van houden. Je bent dus zeker niet alleen! Dankjewel voor je lieve compliment Sigrid! Wat een schattig potje is het geworden. unicorns zijn inderdaad een echte hype, ik heb al veel gehaakte unicorns gezien. haha. Heel erg leuk en bedankt voor het patroon. Zo schattig! En die potjes heb ik momenteel genoeg, dus dit patroon ga ik zeker onthouden 🙂 Duidelijke uitleg met foto’s, daar word ik altijd blij van!